Once in a while, a hotel comes along that is breathtakingly original and truly one of a kind. 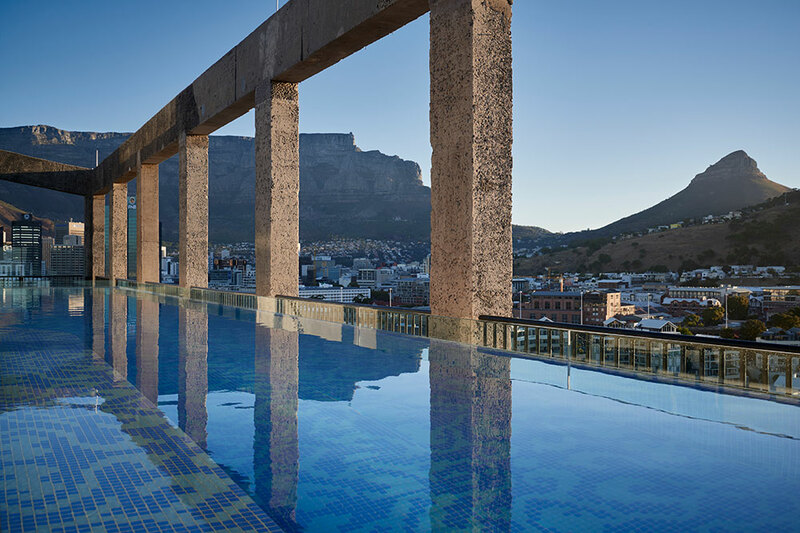 Cape Town has no shortage of notable places to stay, ranging from a superlative hideaway (Ellerman House) to a colonial grande dame (Belmond Mount Nelson Hotel). But The Silo, which opened in March of last year, is much more than just an addition to an already distinguished roster. It is a game changer. 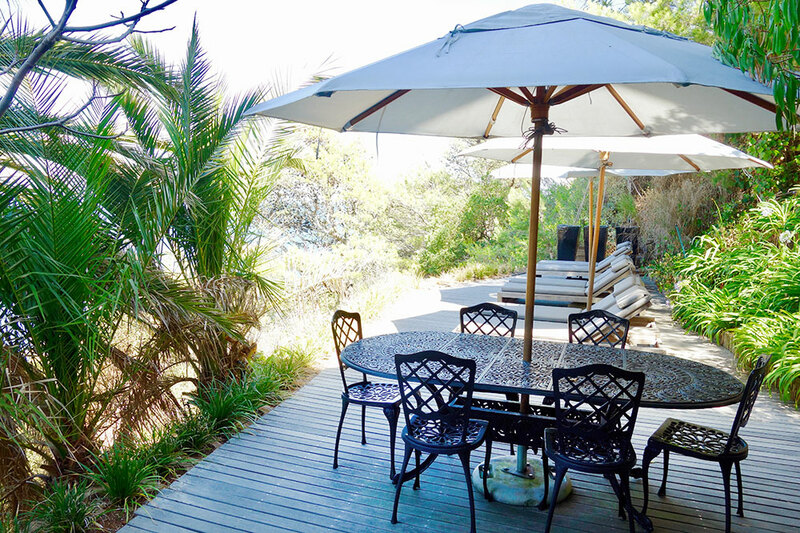 The property is the brainchild of well-known South African hotelier and designer Liz Biden, whose portfolio includes a safari lodge (Royal Malewane), a wine-country estate (La Residence) and a beachfront retreat (Birkenhead House), all of which are Harper-recommended and established favorites of Hideaway Report readers. For nearly 80 years, grain-laden ships headed north to Europe, but eventually, in 2001, the silo was deemed to have outlived its usefulness and it was closed down. As an industrial relic, in an increasingly valuable downtown location, demolition seemed its likely fate. Somewhat surprisingly, the decision was taken to preserve this symbol of the city’s heritage and to repurpose it for the 21st century. 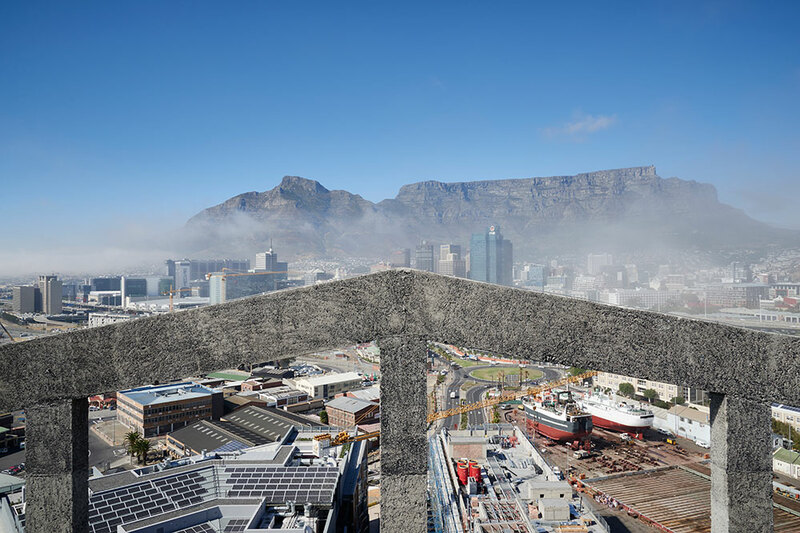 One part of the complex would become a singular hotel, with the remainder of the space being occupied by the world’s largest museum of African modern art, the Zeitz Museum of Contemporary Art Africa, a partnership between the V&A Waterfront and German businessman Jochen Zeitz. The silo complex actually has two elements: a rectangular elevator tower and the adjoining round storage silos themselves. From the outside, the most obvious change is the insertion of multifaceted, blue-tinted windows into the grid of the tower. Each of these comprises hand-cut glass panels, which bulge slightly outward as if they have been inflated from within. An inspired addition by the London-based architect Thomas Heatherwick, the windows are clearly meant to suggest the geometric panes of a lighthouse. Having been politely received at a ground-floor reception desk, we were directed to an elevator, which took us up to the main lobby on the sixth floor. Here the essential components of the new design were immediately apparent: Huge windows flooded the space with light, while the preserved industrial structure of iron pillars and girders was complemented by vibrantly colored furniture and an impressive collection of contemporary paintings. The space was flanked by The Willaston Bar (named for the first ship to have exported grain from the silo) and The Granary Café, the hotel’s principal restaurant. Virtually everyone arriving at The Silo for the first time must stand, as we did, gazing at the mesmerizing view over the waterfront, the marina and the South Atlantic. Over the years, I have checked in at many thousands of hotels, but I can remember very few occasions in which the welcome has been as warm, efficient and hospitable. And the reason was immediately apparent: The staff at The Silo clearly love working there, and they communicate their enthusiasm to guests within seconds. Having chatted with the concierge and been given a brief tour of the public areas, we were escorted up to our Deluxe Superior Suite. I am not easily impressed, but as the door swung open, I could not restrain an involuntary exclamation of surprise. The receptionist, who had clearly witnessed similar reactions on previous occasions, smiled knowingly. 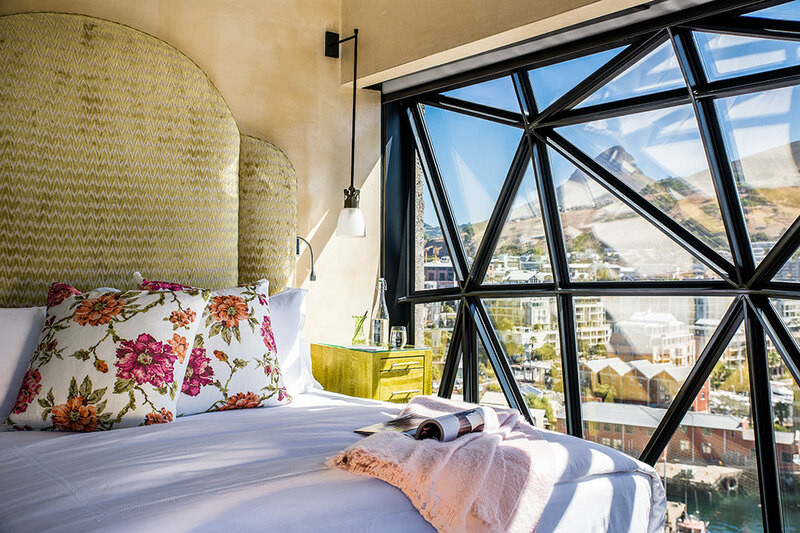 The 18-foot-high latticed windows provided a 180-degree panorama that stretched from the lower slopes of Table Mountain to the distant smudge of Robben Island. The entire V&A Waterfront was laid out directly below. Although the signature windows did not open, sliding glass doors gave access to a balcony, where I was suddenly immersed in sunshine and sea air and surrounded by the cries of seagulls. Liz Biden’s design style is essentially playful, exuberant and eclectic. She delights in bold colors and improbable juxtapositions, with modern paintings next to colonial pieces and art deco furniture in close proximity to Persian carpets and Egyptian chandeliers. Doubtless there are purists who would prefer a postindustrial structure to have a more austere, contemporary appearance. Instead, Biden’s accommodations offer voluptuous comfort and a cheerful theatrical atmosphere. Our suite came with a separate sitting area with a deep velvet-covered sofa, Lucite lamps, glass-fronted cabinets and an occasional table formed from a single giant slab of African hardwood. Slumping down to gaze at the incomparable view, I reflected that it was one of the most spectacular and enjoyable hotel rooms that I’d seen in years. The adjoining bath was also a mini-masterpiece, with a dramatic black-and-white-striped marble floor, white-marble surfaces, a large walk-in shower and a kingfisher-blue ottoman beside a huge soaking tub. The latter was positioned at the middle of a floor-to-ceiling window that overlooked the marina. 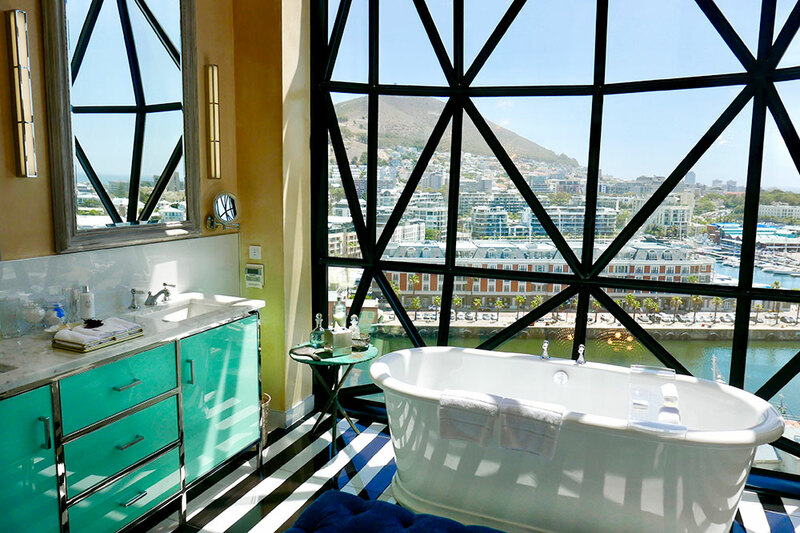 (At the time of our visit, Cape Town was affected by drought and I never had the pleasure of using the tub. Fortunately, winter rains have since alleviated the water shortage and life is returning to normal.) To ensure privacy, gauze-like blinds could be controlled from a touchpad. In search of lunch, I headed up to the 11th floor. 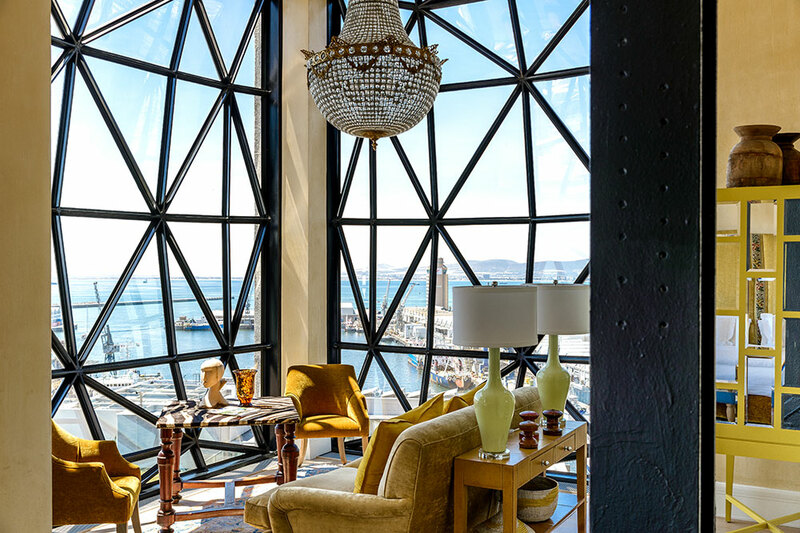 The Silo Rooftop is chiefly for the use of hotel guests — nonresidents must have a reservation — and the management is clearly aware that without restricted access, it could quickly become a tourist attraction. Along one side of the roof is a long, narrow swimming pool. Aside from a menu of salads, sandwiches and flatbreads, there is also a tempura bar and a raw bar with an array of oysters. 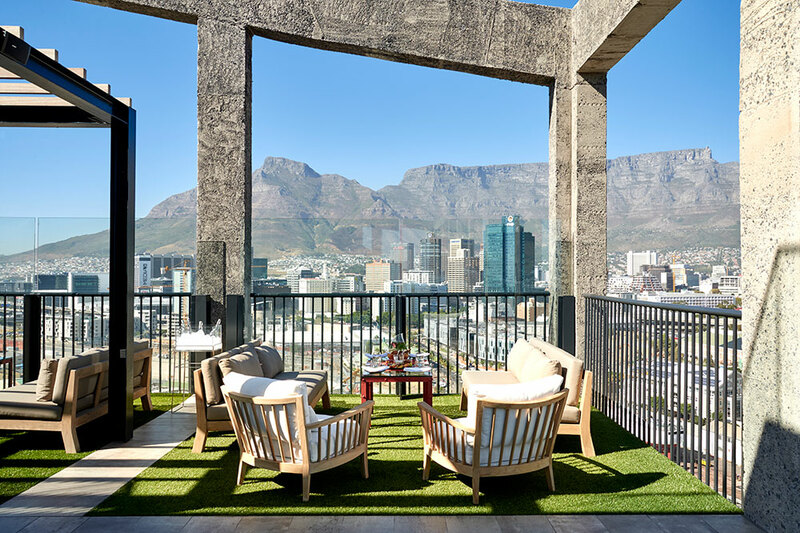 The 360-degree panorama is quite simply one of the finest from any hotel in the world, and treating myself to a glass of Champagne, I sat at a table with an obstructed view over moored cruise ships, downtown Cape Town and the massive slab of Table Mountain. 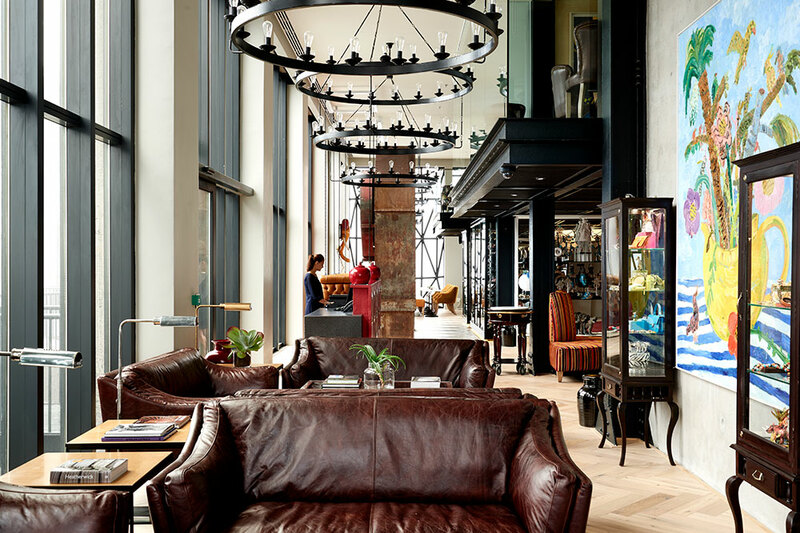 Cape Town has become one of the world’s preeminent foodie cities, with a wide range of exceptional restaurants, so The Silo’s executive chef, Veronica Canha-Hibbert, has sensibly opted to serve “honest and approachable food that showcases seasonal, local ingredients” at The Granary Café. Arguably, the most elaborate meal of the day is breakfast, which begins with a squeezed-juice trolley and a “Harvest Table” with every conceivable kind of pastry, granola, charcuterie, cheese and fruit. This cornucopia is followed by outstanding hot dishes such as smoked-haddock latkes and a soufflé omelet with smoked salmon, feta and avocado. The weekday lunch and dinner menus include contemporary interpretations of classics like steak frites and bouillabaisse, while on Sunday a roast is offered, with cheese and dessert served from trolleys. 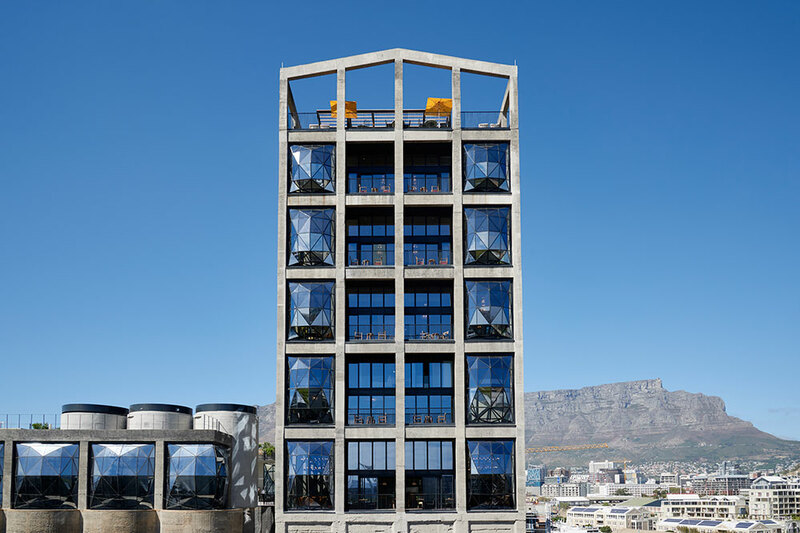 The Silo is a brilliantly imaginative mixture of the traditional and the contemporary, a place where modern African art feels improbably at home with the industrial past of colonial Cape Town. I can’t recall the last time I visited a new hotel that I found so exhilarating and that seemed such an instantaneous addition to the life and character of a city. The property qualifies as a hideaway chiefly because it has fewer than 30 rooms. But despite being at the bustling heart of the V&A Waterfront, it is still a place where you can find privacy and calm. (In addition to seven Deluxe Superior Suites, there are four two-bedroom Family Suites, each with a mezzanine level, plus a magnificent 2,010-square-foot one-bedroom Penthouse.) 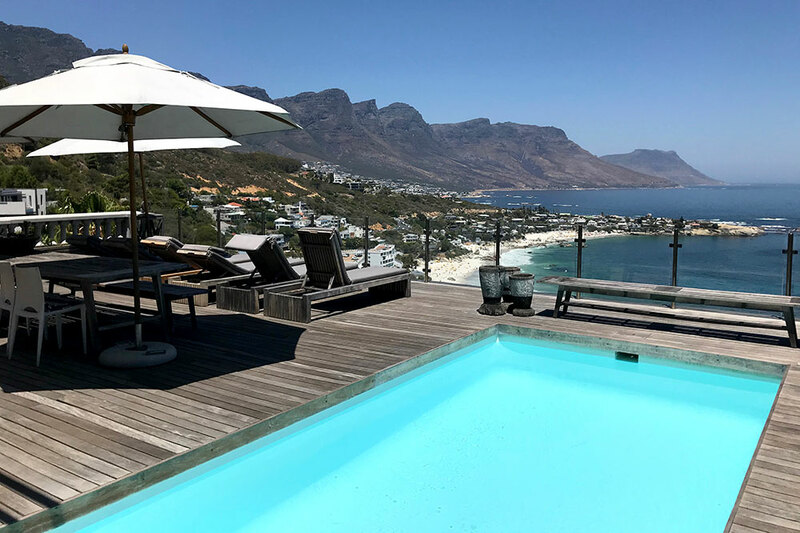 Those in search of deep tranquility, however, generally head to Ellerman House, a peerless 13-room sanctuary set within the mansion of a former shipping magnate, overlooking the ocean in the upscale suburb of Bantry Bay. The concierge can arrange for private tours of the museum. Travelers in search of seclusion but a less formal atmosphere and a lower price point now have a second option. 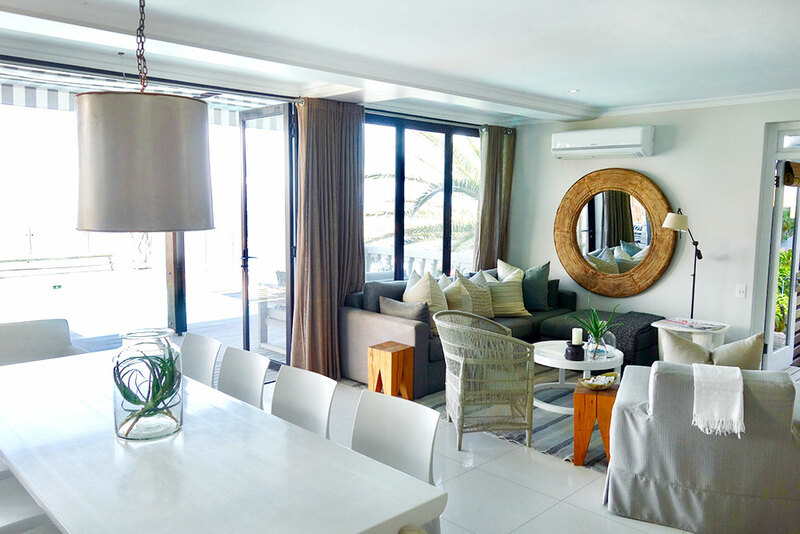 The neighboring residential area of Clifton is generally regarded as the most desirable in Cape Town, due to its lovely white beaches, swaths of Mediterranean vegetation and hypnotic ocean views. 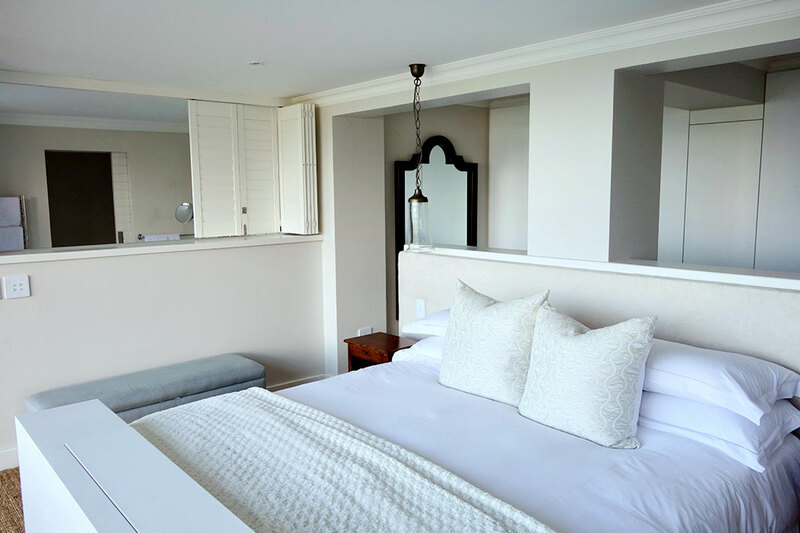 The steep hillside is dotted by many of the city’s most glamorous homes, one of which, Cape View Clifton, located on ultra-desirable Kloof Road, has been converted into a seven-suite guesthouse by a young designer and stylist, Jessica Latimer. The property is laid out on five levels, connected by an elevator, with the small reception area being at the top. Farther down are a tiny library, a fitness room with treadmills facing the Atlantic and a huge open-plan living and dining area with a kitchen and an honor bar. This extends onto a sundeck with a small swimming pool and a row of loungers beneath white umbrellas. 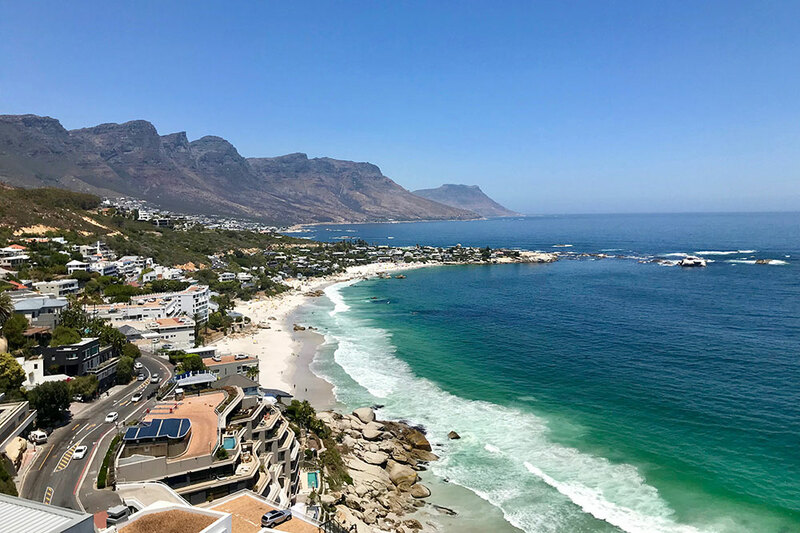 Cape Town is a city of superlative panoramas, but the one from Cape View Clifton — of crashing surf and the jagged peaks known as the Twelve Apostles — has few rivals. The mostly white accommodations come in a style sometimes referred to as “beachfront chic,” with natural fabrics, black-and-white photographs and a scattering of contemporary artworks. The marble baths are well-appointed. I was not able to see all of the suites during my stay, but spacious 1A has a glorious ocean view and a private deck overlooking the swimming pool. Breakfast is the only meal that is served, but local catering companies deliver, and the staff will set up tables as required. And the numerous cafés and restaurants of neighboring Camps Bay are less than 10 minutes away by car. Cape View Clifton occupies a point on a scale midway between a guesthouse and a boutique hotel. During our stay, the staff were consistently pleasant and obliging, but the level of service is below that found at most Harper-recommended properties. Essentially, this is a place that will appeal to those who wish to be left to their own devices, to relax, reflect, read, sunbathe and forget about the world. The stunning location; the tranquil and secluded atmosphere; the cool and elegant interior design. The level of service is more that of a guesthouse than a hotel; the swimming pool is rather small, due to the precipitous terrain. Car services arrive promptly, and it takes only about 15 minutes to be in the thick of the action on the V&A Waterfront.